The Curve is a well-designed office concept at Devonshire Gate. It has planning consent, but offers the flexibility for a purchaser to adapt the design to suit their own needs. 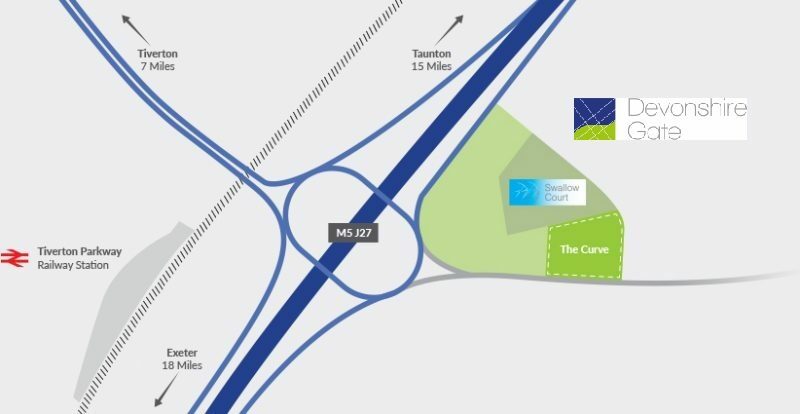 A prime site at J27 of the M5, the site provides rapid access to staff from Exeter, Taunton and Tiverton. The site is on a bus route, and walking distance from Tiverton Parkway railway station. Current architectural plans have been developed by leaders in eco design, Gale & Snowden, to meet the highest environmental standards. investors seeking a sound, long-term ecological commercial property investment. 2 hours rail to London Paddington. The Curve offers you the opportunity to create productive office space, and the flexibility to develop as you see fit. However our vision is for leading environmental standards. The Curve concept at Devonshire Gate is a unique opportunity. partnership arrangements, and funding opportunities. Please contact info@devonshiregate.co.uk or speak with David Disney directly on 01884 840043.